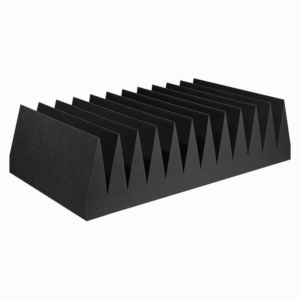 NanKarrow NeoTrap™ Bass Traps are low frequency sound waves dampeners which minimize the low frequency noise of you room. Low frequency sound waves are extremely hard to control and minimize as they are extremely long. When you are building any studio and area that should never be taken for granted is the low end frequency response of the room. The only way to be able to control the low end energy that builds up in the room is by employing effective low frequency absorption. This is accomplished using Bass Traps. Bass Traps work at their best when they are placed in the corners of the room, both vertical and horizontal. Low end energy congregates in the corners so by placing bass traps in the corners you can reduce detrimental effect this has. NanKarrow NeoTrap™ Bass Traps is the standard triangle shaped bass trap. 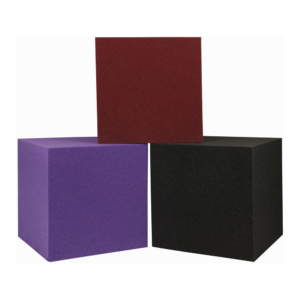 The triangle shape allows you place plenty of mass and thickness of acoustic foam without taking up too much space or at least taking up space that is rarely used for anything else. With the actual dimensional size 24 inch x 12 inch. 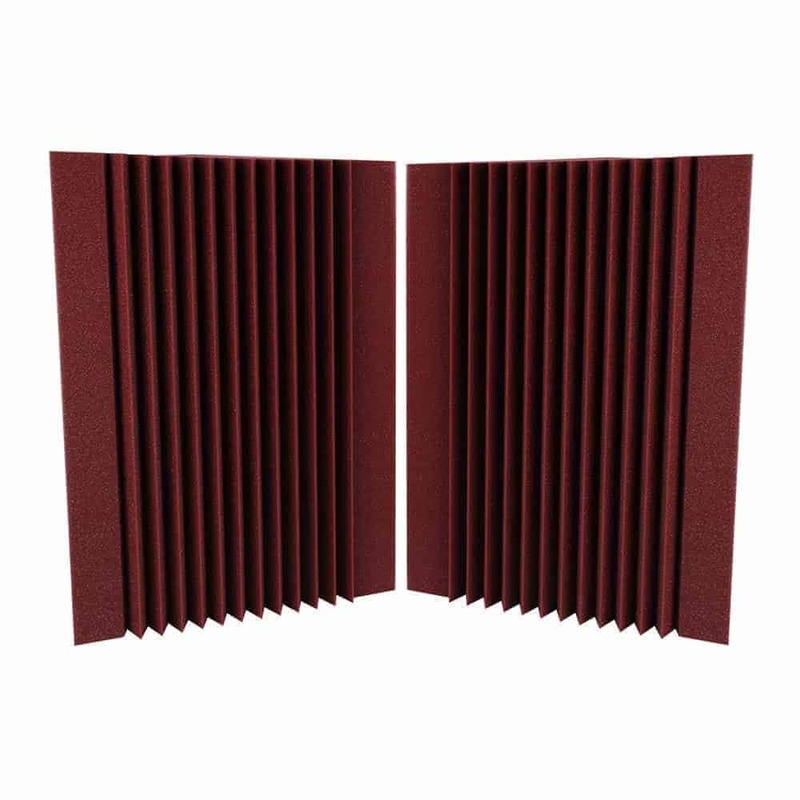 The Bass Trap also has flat surfaces which make it easy to place them side by side with other bass traps. 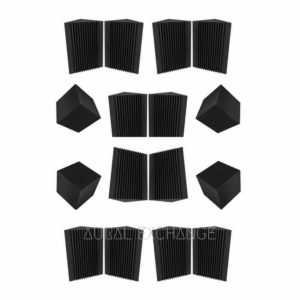 You can also place arrange them together with the Corner Blocs ( NanKarrow NeoCube™ bass traps ). Very often bass control is taken for granted however in any studio and particularly more so in small studios and home theatres, bass control should near the top of the list of priorities. 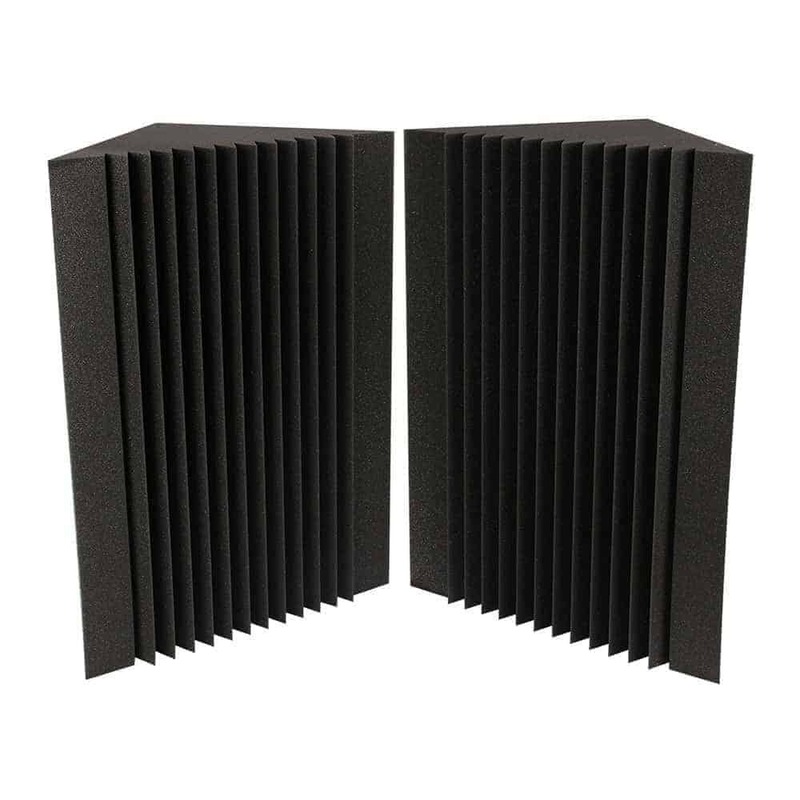 These acoustic bass traps are commonly used in the broadcast and recording industries, as well as home theaters. 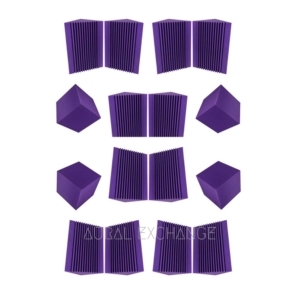 These work well for budged treatment of high frequency slapback, but not nearly as effective as deeper, heavier foam. For months I put up with the boominess of my dubbing booth. I had Nankarrow and Aurica pyramids and wedges inside but still needed to trap bassy vocal frequencies that were bouncing around. Installing 4 corner bass traps was like flipping a switch. My Rode NT2A sounds great without any external E. I’m still keeping the HPF enabled to get rid of ambient home noises but the room but the difference before and after is very apparent. 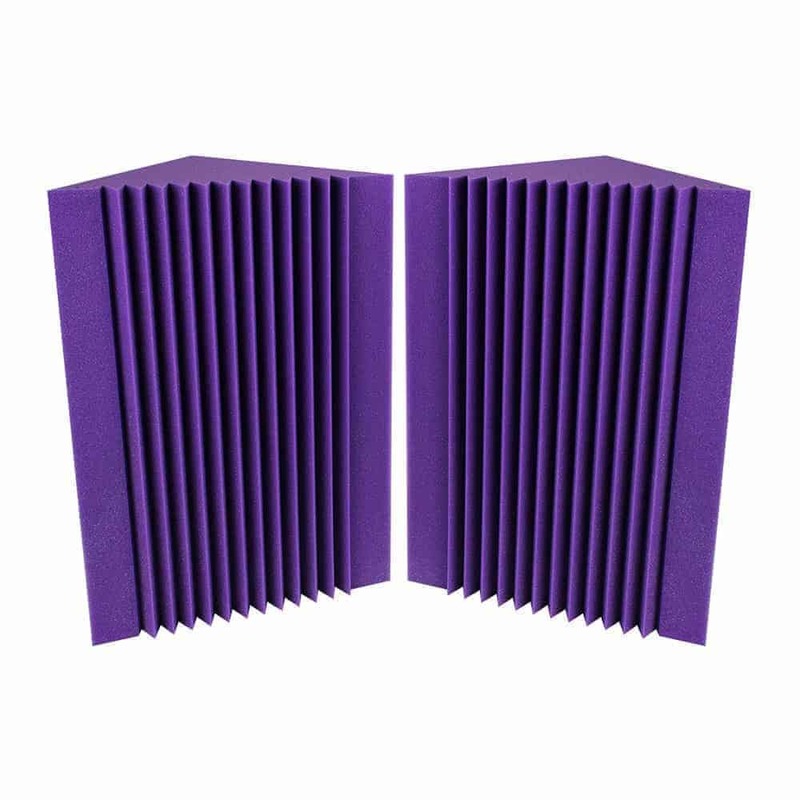 Bass traps, especially good ones are something you don’t really value until you install them and hear the difference they make. While these units aren’t even comparable to real bass traps which I unfortunately cannot afford, they do sop up the loose frequencies hanging around the corner of the room at one-fifth the cost. 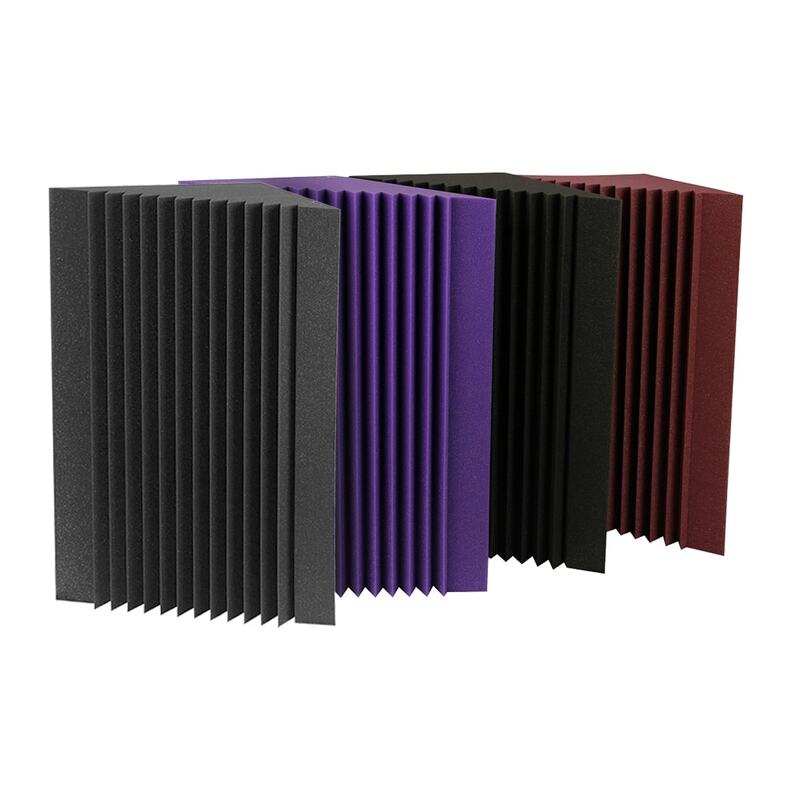 Very good quality, the quality of the foam and the grooves is top-notch. I use a 3dB bass cut on my studio monitors and these do the rest. Seem to be effective above 100hz so they’re actually broadband absorbers. Stacked four on each wall (in the corners behind my desk) and saw immediate results even without sticking them, so I’m going to just leave them like this. I use small 5″ studio monitors and my room had a resonance around 130 Hz which was very irritating. Am able to hear the difference and the room sounds better. These do the job. Removed one star because the order reached me two days later than promised. 5 out of 5	Trap that bass! hese traps were easy to install in my music practice space and really improved the acoustics in the room. The kick drum and bass guitar sound absolutely crystal clear now and the room has stopped booming except at one frequency (low G on bass). Installed only 4 traps on each corner. Can’t to see how they improve a live recording! Just got four of these delivered yesterday and installed them in my tiny dubbing room. Simply love the colour and they’re bigger than I expected! Immediate results – the bass response is so much smoother and the room suffered from a ringing sound for almost all percussion, which has disappeared. Highly recommended and the burgundy colour looks very nice and rich.